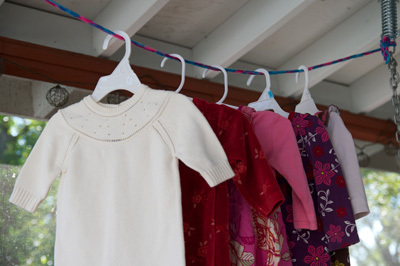 According to the 2010 USDA Expenditure on Children by Families report, the average amount families spend per year on each child clothing ranges from $630 - $1,250, depending on household income and the child’s age. But you could cut that expense by as much as half if you rent or trade in your kids’ clothes. Take clothing rental site Good Karma. For $47.98 per month (or $575.75 per year), you get 7 complete outfits from brands like Carters, Gap and Gymboree, plus 7 sleepers and 7 onesies. For $64.98 per month, you get higher-end brands like Tea Collection, Mini Boden and Ralph Lauren. There are larger and smaller packages available and sizes range from newborn to 24 months. The monthly price includes shipping. If you’d rather piece together your wardrobe, check out Wooky Baby. Most items are available for $8 per month—not a deal for basics, but great for full outfits, costumes and formal attire. You can also choose to purchase at a reduced price. For instance, this 3-piece outfit retails for $29, you can buy it for $16 or rent it for $6 per month. Sizes range from newborn to 3T. If you want to outfit your child in a high-end brand like Dior, Baby CZ and Lotusgrace for a special occasion, head over to Fanciu. 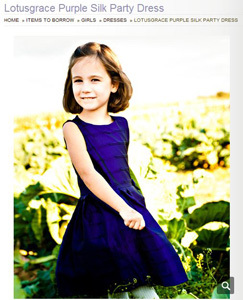 There you can rent a $230 Lotusgrace Purple Silk Party dress for $35 for 4 days. Like women's dress rental sites, the clothing arrives just prior to event date and must be postmarked for return the first business day after. Clothing is available in sizes 2-12. 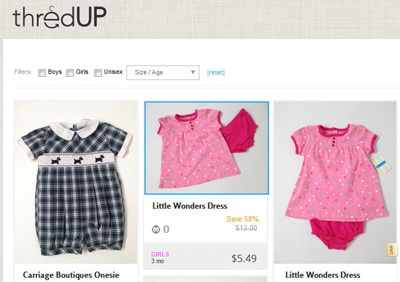 You can cash in your kids’ like-new clothes for cash at ThredUp. They'll send you a free empty bag with a prepaid shipping label, stuff it with your kids’ old clothes and leave it for your mail carrier. There are a few catches. 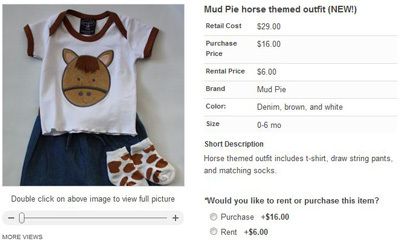 Clothes must have been purchased within the last two years and you only get cash for those items ThredUp thinks it can sell. You get more for premium brands and sizes that are in demand. Plus, you can’t get your items back once you’ve sent them. You can also purchase items at 50% or more off the original purchase price through ThredUp, and, while browsing, I saw a lot labeled NWT, or new with tags. 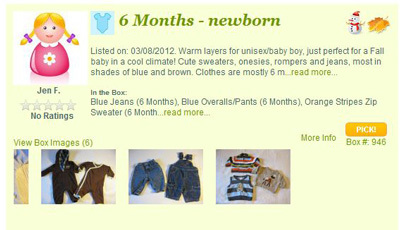 Sizes range from newborn to 18. And if your kids actually wore their clothes more than a few times, you can swap them at OutGrowingIn. You list your boxes of clothing and every time another member picks one of your boxes, you get to pick a box of clothing from the site. You just pay $3 plus shipping. For $24.95 per year, you can see the brand information of what's in the boxes, search by brand and set up alerts for a specific size or brand. Since you only get a box once someone else has picked yours, members have an incentive to post pictures of the box contents and provide details regarding the clothing.